Today is the first day of classes at the 2016 Institute of Genealogy and Historical Research (IGHR). The Legal Genealogist is teaching and has a set of word-of-the-day posts ready to go because this will be such a busy week. It is a sad day. I hope millions will attend Pride Parades around the country this summer to show that this type of hate and intolerance and the violence in Orlando should not be tolerated in this country – or anywhere. Thank you for the post. Yes, we need to show support for our LGBQ neighbors and kin. We need to reach out to our Muslim neighbors with support as well. This act had nothing to do with Islam. It was indeed heartbreaking, senseless, and appalling. The individual responsible was not religious, he was born an American citizen, he was known to be seriously mentally ill, it appears he had not before expressed either homophobic sentiments nor an affiliation with so-called “Islamic extremists”. He was a sick man who grabbed onto an irrational justification for his irrational acts. He bought his weapons legally. As we emerge from our shock and sadness, let’s address the real issues in this particular act, and not make it stand in for other issues. Thank you for your post as well. We are far too quick to jump to jump on the Islamic terrorist bandwagon and incite even more hatred and violence. I am glad to see the two communities come together in their expressions of mourning and addressing intolerance. The rhetoric of racism and fear mongering that has accompanied our our current political environment and the failure to act to reduce easy access to weapons are the issues we need to face as we mourn for those lost and for all of us. I read your post, Judy, stared at the image, said the words out loud. Then I sat for 10 minutes staring at them, with wet eyes. 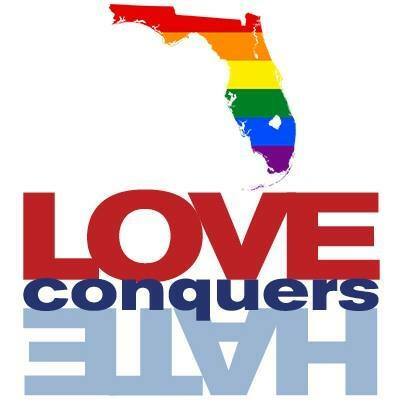 Love conquers hate. Thank you. I agree with you 100%. We need more love and understanding. Thank you. Celebrating diversity in all forms, what a terrible grey boring world we be in if we were all 100% the same. Everyone has the right to live their life as they choose as long as they hurt no one but themselves.